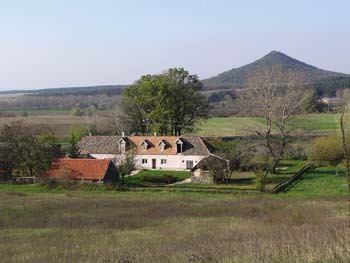 Hilly pastural farmland surrounded by forest., looking onto Hegyesd mountain and the valley below. Beautiful, rendered stone farm cottages that are between 100-200 years old. Interior is renovated during the 90s. Gardens laid to lawn. Barbecue and campfire facilities, garden furniture are available for the guests. Apartment in single storey house. Fully equipped kitchen -diner with lounge-bedroom and a combined shower with WC. This accommodation is suitable for two -four people having twin beds together with a fold-out double bed-settee. The accommodation is equipped with a gas cooker, television (Hungarian chanels) and a refrigerator. A child cot is available free of charge. The enclosed garden has outdoor cooking facilities comprising a stone built tile roofed bbq area with light and power, two camp fire and a large stone built, tile roofed playhouse. The enclosed gardens are for the exclusive use of the guests. The garden is flat and withouth steps making the surrounding panorama also enjoyable for those with mobility impairment. Apartment in single storey house. Fully equipped kitchen-dinner, ground floor bedroom with double bed and ground floor combined walk-in shower with hand rail and WC with sufficient space for a wheel chair. On the first floor there is a large bedroom with twin beds and a further single bedroom. The accommodation is equipped with a gas cooker, television (Hungarian chanels) and a refrigerator. This accommodation is suitable for 5 people (with 3 extra beds if required) A child cot is available free of charge. The enclosed gardens are for the sole use of guests (staying in unit 1 and 2), and have outdoor cooking facilities and garden furniture. Suited also for persons with mobility impairment. Separate house next to farmhouse. Fully equipped kitchen, lounge-dinner, bathroom with bath and WC with handrail, with sufficient space for a wheelchair. On the first floor there is a large bedroom with twin beds, a bedroom with double beds and a thrid bathroom with single bed. The accommodation is equipped with a gas cooker, television (Hungarian chanels) and a refrigerator. This accommodation is suitable for 5 people (plus 2 extra). A child cot is available free of charge. Central heating is available in the heating season. There are outdoor cooking facilities and garden furniture.